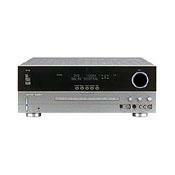 This is an excellent receiver, has plenty of clean power and great surround modes. Logic 7 is outstanding and I use it the most. Very high quality, attractive receiver with the blue glowing Volume control and built to last. This will rock your place. Has plenty of inputs on rear, and even on the front panel for a quick camcorder hookup. You can also set all inputs up for different logic modes and speaker. EZ Set works well. This receiver is awesome in every respect. Still going great after 14 years after a lot of use. Easy to setup, great manual, nice GUI. My setup is 6 speakers JBL and Polk, Polk Sub, CD, DVD and HK Bluetooth BTA 10 adapter, Purchased a phono adapter to play records with an HK ST-7 still working 41 years old. TV hooked up via optical, CD & DVD setup with Coxial. Remote is nicely made and fits the hand well in my opinion. Thank you HK for an awesome product. Great Looks, Great performance---excellent volume (Star Wars:EpsIand II are recorded at low levels, try the new Texas Chainsaw Masacre, or Finding Nemo, or The Incredibles) and wonderful musicality for a receiver. Only one rear surround output (fixed by te new AVR235), Possibly could have a tad more power. This receiver I have reviewed before, at the time with only a couple of months of use, and not entirely the proper setup. At this time, The receiver is running Boston Acoustics CR6 as center and rear surround, Bose 501 V for surround, and Bose 4001 for mains, with a Boston PV400 subwoofer. The Bose will be replaced soon, but with the Boston Center, It really does sound good. This receiver does not have the shortcomings which I believed it to have when I first owned it. Distortion at volumes of -10 was due to the speakers I was using, since that time they have been replaced and the new ones do not distort. This receiver has also never, ever shut down, even at volumes of 0dB. The 6.1 (Dolby Digital EX or DTS ES) is absolutely spectacular. If you can find a good movie that uses this feature, it is definitely worth it. If you haven't heard EX or ES using a rear surround (or two for the new AVR 235) think of it this way. Remember the first time you heard 5.1? You'll experience that "wow" factor again. It really is fantastic. The receiver performs flawlessly, will operate at volumes that make my ears ring, and with a powered subwoofer it is possible (DVD audio especially) to get sound quality very very close to a live performance, both in tonal qualities and volume! This is a great receiver! 10 years ago this receiver would have costed $1K easily, well worth the price today. If you can get the AVR235, do that. If price is a concern, the discontinued AVR230 will in no way disappoint. Denon, Onkyo, other H/K, Sony etc. Also have used Rotel, which this receiver is not too far off Rotel sound quality! Picked up this receiver on sale from Circuit City and couldn’t be happier. It replaces a 1 ½ year old Denon AVR 1403, and while the Denon is rated at more watts per channel, it simply cannot touch the HK in sound quality. Every consumer review site will have positive reviews for any product you’re looking at, and everyone has their own opinion about what makes a receiver sound good. The tonality of Denon is decent, but they lack dynamic punch. Where HK stands out is instead of just throwing out a bunch of sounds, every instrument, voice or sound effect is presented with proper weight & timber. Each sound has dimension, is properly placed within the sound stage, and is palpable. I bought this receiver for music as much as home theater use, and it excels in all areas. Comparing to the receivers I have owned, including Sony, JVC, Pioneer, Yamaha & Denon, the HK simply reproduces the sounds being fed to it more accurately than anything I’ve heard before. I am hearing things in songs & soundtracks I’ve never heard before. This can be a bit disconcerting at first, because you’re expecting one thing, and getting more. Then you begin to realize what you’ve been missing. Some people may be put off by the 50 watts per channel rating (65 stereo). What most people don’t realize is that it’s not watts that make the difference, it’s amperage. It’s kind of like the difference between Horse Power & torque in a car. Torque is the twisting force that turns the wheels, and amps are what deliver the hit of a drum, or the shot from a gun in a movie. This receiver’s ability to deliver the dynamics of all material given to it is not hampered by the watts rating. Some people have complained that they have to turn up the volume to a point where it distorts before getting loud. This is something I have seen in many home theater receivers. Each speakers level can be set individually, and what I do is set my two front main speakers to their highest level (in the case of the HK +10) and then set the other speakers accordingly. This requires the use of an external SPL meter instead of the built in EZ set feature, but the results are well worth it. In addition, the external meter will allow you to also set up the subwoofer, something the built in EZ set does not do. The remote? Use it to program a universal learning remote, and then put it away. The receiver does run warm, so give it room to breath. My only gripe with the unit is that switching between TV channels sometimes causes the surround mode to change (the Logic 7 sounds great BTW). I have set a button on my universal remote to change it to what I want, but still, it would be nice to set & forget. Overall, a much better choice than the other major brands. The only weakness I found is that with inefficient speakers the amp does eventually run out of power at high volume. I have needed a receiver for a while now, and after previously owning a fairly high-end system made up of all Rotel seperates, I knew I couldn't settle for a low powered receiver. I wasn't intending on spending much $$, as I planned to purchase seperates again someday to build a really nice home theater setup. So, I checked stores like Circuit City and Best Buy, and I thought I wanted a modestly priced Yamaha Home Theater receiver, probably about $250. When I saw the HK AVR 230, I was first very impressed with the look of the receiver. I then had some time with the receiver in Circuit City's sound room, alone, to see how it sounded. I was very impressed at how clean a receiver with so many features could sound, especially after owning the "award winning" Rotel RB 980bx amplifier. At that point I did not want a lesser receiver. I bought the HK receiver online (nextag.com will show you a great price). I have read many reviews, both on this site and in magazines, and I mostly agree with everything I've read. The sound is spectacular, with ample bass and a very clean overall sound. If you have efficient speakers, I expect this receiver to perform much better than you will even need it to. I have had a Sony Dream system for about 2 years, and I must say the HK reveals details and sound qualities that I did not expect from a receiver. It really does sound great, plus it has all the features you could ask for and will definitely grow with your home theater system. I especially like the fact that it has full component inputs and outputs for HDTV and Progressive Scan capable DVD players and video game consoles, and I also very much like that there are full preamp outputs for every channel, so when I do buy seperates my HK AVR 230 will serve as a very good surround sound processor. But, if the receiver sounds so great, why would I still need seperates? This is the only negative comments I can make about the receiver. Although the receiver does seem to outperform its modest power rating, in the end it still is a receiver, and rated at only 55watts in surround mode (65x2 in stereo). I mentioned earlier the receiver should perform very well if you have efficient speakers, but I unfortunately do not. At high volume levels, which I do enjoy to get full impact of some CD tracks and some movies like Star Wars Eps I and II, and Lord of the Rings, the amp in the receiver does begin to clip at about the -10dB volume setting. I do admit, however, that I am not currently the proud owner of a powered subwoofer, so my main speakers have to pound out all the bass, and this may exaggerate what many people will surely see as a non issue, as most people may not turn the volume that high (my speakers are only about 86dB/1watt sensitive). I would say that those who own speakers with sensitivity of 89dB and above will never experience the clipping that I have. When the amp does clip, the distortion is very audible especially in the tweeters. Finally, would I recommend this receiver? Absolutely. It has a gorgeous sound, is beautiful to look at, has a wealth of features, and with the great online price I found I seriously doubt a receiver could be found that would match it. This receiver is definitely on par as far as overall sound quality to the Rotel setup I had, just not nearly as much power. My only other experience with home theater has been a Sony Dream system, which this receiver is simply better in every way. If this is your first or second home theater purchase, you will most likely be very satisfied. Note: Price stated is in Canadian dollars. I purchased this receiver along with a set of Athena loudspeakers (AS-B2, AS-B1, AS-C1, AS-PW400) for surround setup. Reason for the buy was to replace an aging (20+ years) and dying NAD/PSB stereo system. This was a better than average system known for its dynamics, clarity and accuracy. I was looking for a surround system that was at least equivalent in sound quality and was biased for music rather than soundtracks. Lastly, Future Shop had everything on sale and I lucked into a couple of open box deals. I didn't bother auditioning at the store. I view this as a waste of time because home and store acoustics are completely different. A system might sound great at the store but terrible at home. Of course, the converse can also be true. It's worth ensuring that a store has a reputable return policy such as Future Shop in case the system turns out to be unsuitable at home. I did, however, do my research on the internet, including this website, and found a multitude of favourable reviews on the receiver and the speakers. In a store setting, I am more interested in the physical attributes, e.g. size, weight, colour schemes, features, etc. My home setting is a basement rec room with area of approximately 400 sq ft. Floor is carpeted, ceiling is tiled, walls are a combination of drywall and wood panelling. Setup of the receiver was a snap. Owner's manual was very detailed and comprehensive. A colour coded summary guide was provided for the first time audio system buyers. Receiver was set to large for the front, rear and centre speakers. After that, the EZSet feature on the remote was used to calibrate the speakers. It took about a minute. Calibration was required for each sound mode. For fun, I moved to different positions in the room and recalibrated the speakers. It seemed to work everytime. Speakers can also be adjusted manually. The setup of the subwoofer must be done manually but I found that to be a minor inconvenience. I set up the crossover and volume controls at the subwoofer and the crossover controls at the receiver. Volume controls in the receiver were left at the default setting. Delay settings are also manually adjustable but were left on default setting for now. The receiver has plenty of inputs and outputs. Connected are a 5 disk CD/DVD player, VCR, cassette deck and DSS receiver. Still room for a separate CD player and one or two more accessories. The receiver has composite, S, and component video inputs for everything. For audio, 2 digital optical and 3 digital coax inputs are provided along with the usual analog inputs and outputs. Digital outputs are also provided. Note to the LP collectors - this receiver does not have a phono input. That deficiency can be overcome with the purchase of a phono pre-amp. The receiver also does not have multi-room capability but this was not a factor in my purchase. Being new to the surround sound scene, I am still learning all of the various sound modes provided. Initial impressions are that Dolby Pro Logic II and Logic 7 have the most pleasing sound. After listening to these modes, stereo mode is confining. I was apprehensive about the modest power rating in that it couldn't deliver the volume and quality of my old system. This turned out to be a non-issue. The HK had no difficulty producing plenty of volume and punch. The receiver might have trouble in larger, open areas. Pre-amp outputs for all channels are provided to connect external amplifiers in case more power is needed. Overall sound characteristics are very similar to my old system. Clarity, smoothness and bass extension are impressive even though the speakers are not broken in yet. One very pleasant surprise is that I hear details in music I hadn't noticed before. I foresee having loads of fun for months to come relearning my music collection. This might be an attribute of the speakers as much as the receiver. It might also mean that the speakers and receiver are well matched. I am satisfied with the quality of movie soundtracks. Centre channel vocals are crystal clear and realistic. Front and surround tracks are fine. Plenty of bass is delivered although not the kind of bass you can feel (this is likely the subwoofer, not the receiver). But then again, my priority is listening to music. My biggest complaint, although not a show stopper, is that the display is surprisingly cluttered with unnecessarily detailed information. I say this because the overall design is otherwise clean and uncluttered. The information is useful during setup but not needed for normal operation. All in all, I am very pleased with the purchase. Sound Quality - Very nice 2 channel sound, awesome multi-channel sound. A very smooth top end and excellent separation distinguish this receiver from the competition. EzSet - The EzSet functionality is an excellent time saver when setting up your receiver for the first time, and is also helpful if your listening position changes frequently. Simply carry the remote to your listening position, set the volume to -15, hit the SPL button on the remote and enter 5 for 5 channel surround or 7 for 6.1 or 7.1 and the receiver will output a white noise test signal which is picked up by a microphone built into the remote and the system adjusts speaker levels automatically. Since I don't have an ideal setup for my listening room (I find myself listening left of center at my computer or right of center in my recliner), being able to adjust the levels based on which side of the listening room is sit quickly and easily is a nice benefit. Surround Flexibility - If you can't find a surround sound format from this receiver that you prefer, then you should probably stick to 2 channel, or mono for that matter! With a variety of technologies from Dolby Labs, DTS, Harman Kardon and Lexicon surely you should find a mode that meets your satisfaction. Value - Under $500 is a very challenging price point. Similar technology to EzSet is available on other receivers (and some go even further not only adjusting levels, but also delay, something that is a manual adjustment on the AVR 230) is available from other manufacturers, but usually at a much higher price. Pioneer (not the Elite line) and in Particular Onkyo and Yamaha are strong competitors but overall I wouldn't trade my Harman Kardon AVR 230 in for any competitive model. It sounds excellent, is very flexible and in my opinion is one of the most attractive receivers on the market. The first weakness I noticed was the fact that when setting levels, using EzSet or manually, the Harman Kardon AVR 230 does not send a test signal to the subwoofer. As a result, you must set bass levels manually without the benefit of a test signal...an imprecise method to be sure. I feel I'd taken 1 step forward with EzSet and 1 step back since I still had to haul out my white noise test CD and set the bass level manually). In comparison my Pioneer Elite VSX-26TX had a subwoofer test signal and many other receivers do too so I'm puzzled by this omission, particularly since the Harman Kardon AVR 230 offers greater flexibility in setting cross over frequencies and levels independently for each speaker location...L/R, Surround, Back, Center) than many much more expensive receivers and pre-amps for that matter. After much experimentation I settled on "small" settings for all speakers, a 60hz cross over frequency for my front and surround speakers, these 4 speakers are exactly the same, and 100hz for my center channel, a much smaller, horizontal version in the same family as my mains and surrounds. I've always been a little disappointed in my center channel...I've always felt like it sounded more "boxy" than my other speakers. Setting the crossover for this speaker higher than the others has resulted in a much more pleasant sound from my center. The next weakness is more my fault than Harman Kardon's...I didn't realize when I purchased the system that none of the receivers in the AVR x30 have a phono input. I must admit a little disappointment as I wanted to hear some of my vintage albums in Logic 7 or Pro Logic II surround sound. Guess my next purchase is an external phono pre-amp. Another minor point, there are no "aux" or "phono" labels on the system or remote so I'll have to choose Vid 3 or 4 when I do hook up my turntable. Finally, while the remote is multi-function, it is not a learning remote. Also the remote is somewhat unintuitive. I should first mention that the MSRP for this unit is incorrectly stated here on Audioreview.com...the correct MSRP is $549.00. I've seen the unit advertised anywhere from $450 (Circuit City online) to $500 from several other online vendors. I paid $475 retail at Circuit City. I previously owned a Pioneer Elite VSX-26TX so the Harmon Kardon AVR 230 had a lot to live up to. What attracted me to the Harmon Kardon were the new surround sound capabilities not available on my 2 year old Pioneer Elite VSX-26TX (Dolby Pro Logic II, Dolby Digital EX, DTS ES, DTS Neo:6, VMAx and most important, Logic 7, a much praised surround sound technology from Lexicon, a professional division in the Harman Kardon family). Other attributes that attracted me to the Harman Kardon AVR 230 is the attactive, black plexiglas, silver face and the Harman Kardon legacy of great sound. After spending my first weekend with the AVR 230 I am glad to report I am very happy with the receiver. I was originally concerned about power from the Harman Kardon AVR 230(50 WPC x 6) versus the Pioneer Elite VSX-26TX (100 WPC x 5) but I'm glad to report that power hasn't been an issue. Even the most challenging source material was presented with an amazing level of intelligibility, enveloping surround performance and a smooth, natural presentation. In fact, one of the interesting things I've noted during listening is the fact that I'm actually listening at lower levels than I had previouly with the Pioneer Elite VSX-26TX. With the Pioneer Elite VSX-26TX I usually had to listen at levels around -10dB to -15dB to get the best performance from the surround channels. With the Harman Kardon AVR 230 I get the same enveloping surround performance at -25dB to -35dB. On Star Wars "The Phantom Menace" and "Attack Of The Clones" using Dolby Digital 5.1 dialog was clear, surround effects well steered and bass palpable (though my sub-woofer's built in amplifier is mostly responsible for the bass output). All of these attributes point to a capable Dolby Digital decoder. The DTS 5.1 decoder in the Harman Kardon AVR 230 did an excellent job as well on the ELO "Zoom" concert DVD and my favorite source material of late, Allison Krauss + Union Station "Live". With 2 channel sources including The Police "Ghost In The Machine" a 2 channel SACD and Lyle Lovett's "Pontiac" on CD, the Harman Kardon AVR 230 had excellent separation, a very smooth top end and realistic bass. Overall the Harman Kardon AVR 230 is an excellent sounding receiver. The most exciting part of my weekend has been spend listing to the different surround modes of the receiver on non surround encoded material. The VMAx might be interesting to people who haven't made the leap to 5.1 or 6.1 surround and only have 2 front speakers, personally I found the effect a little too reverberant. Personally I was more interested in how VMAx affected headphone listening, suggested in the manual to eliminate the "in-your-head" effect of headphone listening. Personally I found the effect subtle at best and prefered normal stereo for head phone listening. The most fun I had was switching between the new Dolby Pro Logic II modes, DTS Neo:6 modes and Logic 7 modes. First, the DTS Neo:6 modes didn't really do much for me. They're not unpleasant by any means, and I can see the benefit of this format on previous receivers before Dolby Pro Logic II was an option (and receivers where Logic 7 is not an option), but in contrast to the other formats, DTS Neo:6 simply paled in comparsion to Pro Logic II and Logic 7. I think I've settled on the following surround sound "rules" for now. Pro Logic II for anything Dolby matrix encoded, not necessarily because it sounds better than the other modes (though both Pro Logic II and Logic 7 are much improved over Pro Logic) but more because I feel like sticking with Dolby technology will be a closer match to the matrix encoding than using technology from another company. On the other hand, the most pleasant surround technology to my ears is Logic 7. I've spent hours revisiting CDs that I hadn't listened to in years using Logic 7 (and Pro Logic II music to a lesser extent) and I've finally found a surround technology that does more good than damage to non-surround encoded sources like CD and stereo television broadcasts. The differences between Pro Logic II and Logic 7 are subtle but even I can hear them. Pro Logic II seems to send more signal to the center channel and seems a little "drier" than Logic 7. I can't stand excess reverberation, something that has turned me off from every receiver's hall/theatre modes so I'm a little surprised that I prefer Logic 7 as the center channel seems a little less dry, but overall the effect sounds more natural. If I can sum up the Harman Kardon AVR 230 in one word it would be...natural. I highly recommend this recever. Sound is amazing. Easy setup feature. Blends great with my Cambridge inwalls. I auditioned many receivers in this price range. I was willing to sacrifice some features for the best sound so I chose the HK 230. I watched clips from Star Wars Episode II on it and it sounded amazing. Music was great as well. This is my first HK product and I am very pleased. I highly recommend. I also auditioned the Pioneer VSX912, Yamaha HTR-5660, Sony STR995, Denon 1804 and Onkyo 601.